Mobile self storage is the same as regular self storage but more convenient and cost effective. With traditional self storage, a part of the reason their facility fees are so much higher than our low storage fees are because your access costs are built into the monthly storage fees. Most storers rarely visit their goods in storage. Yet they pay exorbitant monthly facility and storage fees for the installation and regular upkeep of automatic gates, roller doors, and tiny lifts (that break down the one time when you do visit). If our customers require access, we say yes, it’s free and your storage is still a low price. If you choose traditional self storage, you need to first get a vehicle to take your stuff to the storage facility. Rental trucks and their insurance are expensive, and removalists are around $150.00 per hour + travel costs. You or your removalists then load the vehicle at your premises, drive to the storage facility, unload the truck at the storage facility. You will have to share with other storers the small trolleys if they are available and load your goods into the small lift. Finally, you trolley your goods to your storage unit which is usually not close to where you parked your truck. Here at Shuttlebox we free deliver the storage box to your premises, you then get up to 24 hours to load it, you lock it and keep the key, and transport it for free back to our secure storage centre. What could be simpler? What are the benefits of mobile self-storage? LOAD AND UNLOAD ONLY ONCE! – We deliver our Shuttleboxes right to your home driveway or office for you to load. Once loaded, we return to collect and store your Shuttlebox in our secure storage centre. Every time you move your belongings there is the chance of something getting damaged, so the best way to look after your goods is to minimize the amount of times you move them. With Shuttlebox, we take the storage space to you. You simply take your belongings from your house and place them directly into your Shuttlebox, we then come back and take your Shuttlebox back to our secure storage centre. There is no unnecessary movement of your belongings, therefore minimizing the chances of your goods getting damaged. – No need for rental trucks or making several trips to a regular storage facility where you may struggle to find a trolley or get stuck waiting for the lift. How big is the Shuttlebox and how many will I need? Each Shuttlebox usually accommodates an average room to a room and a half of household belongings and can hold up to 1 tonne of weight. 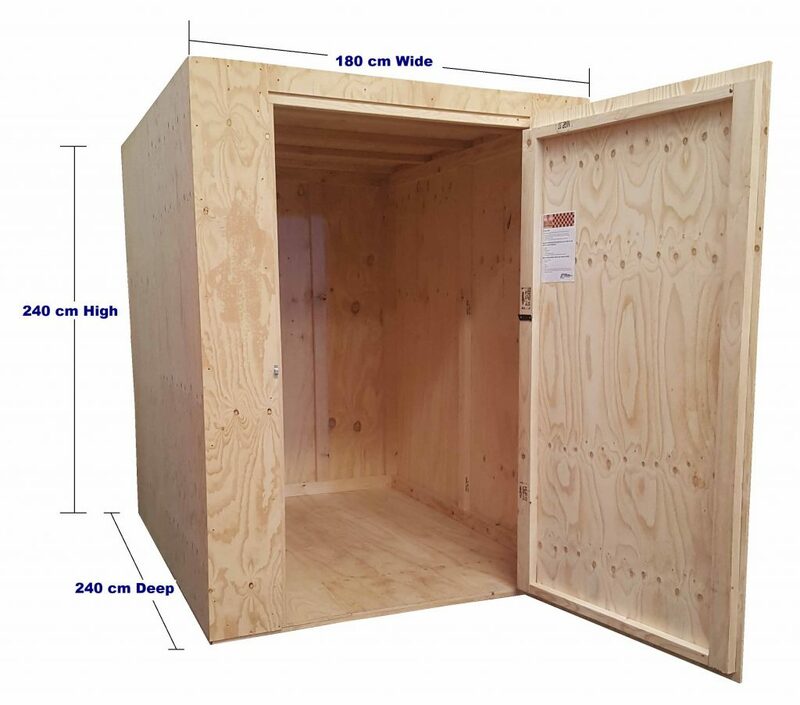 At 2.4 metres long, 1.8 metres wide and 2.4 metres high, it has 10 cubic metres of actual internal storage space, which makes Shuttlebox one of the biggest in the industry. Check out our easy to use storage calculator. Can I access my Shuttlebox when I want? Yes, you can access your Shuttlebox 6 days a week. Click here to arrange a time to access your ShuttleBox. How much does my Shuttlebox cost? A full list of our rates can be found on our pricing page, or you can use our quote calculator. What if there is no room on the street for the Shuttlebox? Your Shuttlebox will be placed at the location of your choice and will take up the space of an average car. If there is no room available directly in front of your property we will deliver it wherever you would find to be the most convenient for loading and/or unloading, e.g. on the street or driveway. Don’t have a driveway or car spot for your Shuttlebox and looking to get your Shuttlebox parked on-street? In unrestricted parking zones (where no permit or hourly zones apply) your Shuttlebox can be delivered on to the street directly outside your front door without the need for a parking permit. If parking outside your residence is restricted (that is, if permit or hourly zones apply) we can only stay with the trailer for as long as the parking sign allows. Note – any fines incurred will be passed on to customers at cost. Are there any items I cannot put in my Shuttlebox? How long do I have to pack my Shuttlebox? Up to 24 hours, however we can wait onsite while you load for up to one hour, this option is handy when there is limited parking available. Shuttlebox carries our own insurance but it is your responsibility to insure your belongings. We can arrange insurance for you through a third-party supplier at your cost. How do I pack my belongings? To ensure that your goods are re-delivered in their original condition, here are some key points to consider while preparing to load your Shuttlebox. Use correct packaging materials. Be extra careful that items don’t move during transit by carefully restricting their movement by using the correct packaging materials. Put as much as you can into boxes. Boxes provide greater protection for your goods and will make loading and unloading your Shuttlebox easier. Fill each box to its capacity, using butchers paper or fillers to eliminate empty space. Tape the bottom of each box for added strength. Please ensure that no liquids, foods or perishables goods are stored in your Shuttlebox. Make sure that fridges and freezers have been defrosted and emptied before loading into the Shuttlebox. Protect metal items from rust by wiping metal items with a rag dipped in oil to protect them (not cooking oil). Label boxes on all sides to make unloading easier. Please note that while we do offer a service to load your Shuttlebox, it is your responsibility to properly pack and protect your goods in advance. You can order from our extensive range of packing materials and tools for you to use to pack your goods safely and securely prior to the pickup of your Shuttlebox. Check out our range here. How long can I store my Shuttlebox for? As little as one month or as long as you want. We have discounted rates if you stay for 6 months or 12 months and pay upfront. Where will my goods be stored? In a clean, pest controlled secure storage centre in the suburb of Botany NSW which has a state of the art security system keeping your goods closely monitored. Can you pack my Shuttlebox for me? Yes we can, we have just introduced a new Shuttlebox loading service. You pack your goods, we load them into your Shuttlebox, you lock it and keep the key and we will take it away and store it. For more information call us on 1800 838 956 or click here to view our rates. Shuttleboxes are made from a super strong timber structure, which means the box is breathable so your belongings will stay fresh & don’t go mouldy unlike metal containers which sweat and in turn drop condensation onto your belongings. It’s also waterproof as it will be raised off the ground and wrapped in a waterproof cover. How do I pay for my Shuttlebox? Ezidebit has invested heavily in attaining the world’s highest payment security accreditation – PCI Level 1. This means that your personal banking information is being handled with the highest level of payment security. Ezidebit is backed by Global Payments Inc. (NYSE: GPN) – a Fortune 1000 company and one of the leading payments services providers world-wide. With one of the most respected payments service providers behind us, Ezidebit has what it takes to deliver the highest level of payment security now and into the future. Who will have access to my ShuttleBox? You will lock your Shuttlebox and you will be the only one to hold the keys. Shuttlebox employees do not keep the keys to your lock. There is a-state-of-the-art security system at our secure storage centre ensuring the security and privacy of your Shuttlebox. Send us an email using the form below and one of our friendly team members will get in touch with you shortly. You can also call us on 1800 838 956.